Today I can finally share two new CB photos with you. 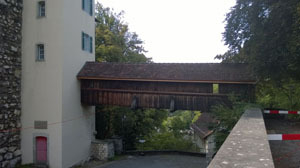 The bridge in the town of Rabenstein is relatively new. I still try to find out more about it and work on getting a better picture. The one shown here is not mine. 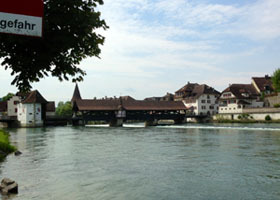 The Bremgarten bridge picture, however, was taken by me two weeks ago. Here I am with two more photos from Switzerland (courtesy: Robert Stein). 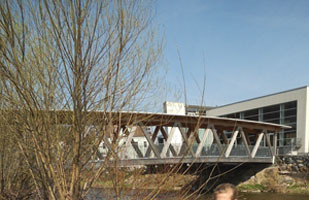 They were taken in the city of Aarau, Canton of Aargau. The old city castle (Aarau Schläossli) dates back to the 13th century. 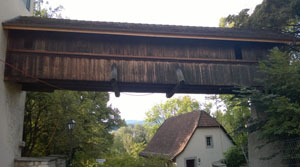 A wooden covered foot bridge was added to the tower in the 19th century in order to cross the moat/trench. It can be seen on these two pictures.